China’s hit romantic comedy series Ode to Joy <欢乐颂> is back for another season, returning to TV screens on Thursday, May 11 on Dragon TV. 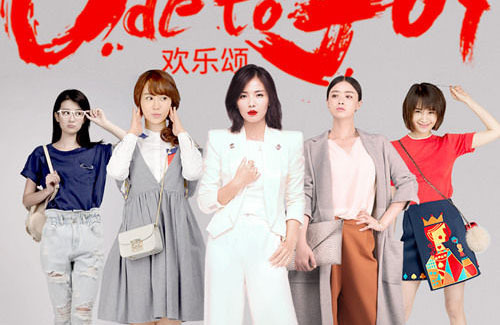 The series, deemed by critics as China’s answer to The Big Bang Theory, stars Liu Tao (刘涛), Jiang Xin (蒋欣), Wang Ziwen (王子文), Yang Zi (杨紫), and Bridgette Qiao Xin (乔欣) as five women who live together on the 22nd floor of an apartment complex known as “Ode to Joy” in Shanghai. They each experience their own obstacles in career and love through the years, drawing them closer together than ever before. Wang Kai (王凯) reprises his role as the flirtatious medical doctor “Zhao Qiping”, with Zu Feng (祖峰), who played Liu Tao’s love interest in the first season, returning as a guest star. Jin Dong (靳东) also makes a special guest appearance. It’s been exactly a year since the five women were last seen on screens together. Our five leads shared that their characters have all matured as the year went by, and the second season will reflect this development in their characters. As Liu Tao’s “An Di” discover more about her own perspectives on love, Jiang Xin’s “Fan Shengmei” become more and more independent as she learns how to navigate a life without the burden of a financially-strained family. Wang Ziwen’s “Qu Xiaoxiao”, the young sassy and fierce daughter of a successful businessman, gets to explore more of her own background and growth. Ode to Joy 2 premiered on May 11, 2017 on Dragon TV.